Is it just me, or does it seem like everyone’s become disconnected in regards to how their food gets on their plate? We had some REALLY gorgeous weather last week, and then a cold snap on Sunday. 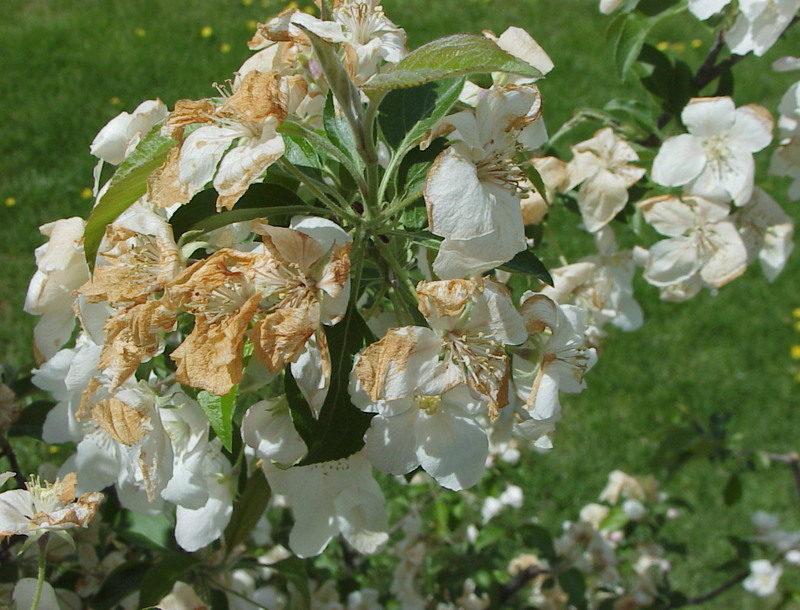 I mentioned how rough my apple blossoms looked after the frost on Sunday. They don’t like the cold! Last year, the apple trees blossomed a good TWO months too early, then the cold weather snapped back. Absolutely devastating for the local growers. (Michigan is the nation’s third largest producer of apples.) Last year, we had NO apples. Period! The local cider mills had to ship in apples from other states. You would have thought this would have been in ALL the papers, but I barely saw ANYTHING written about it. And yet…I know there are orchards down the street from us that may go out of business if they have another bad year. But when I talk to people I know about this, it’s like they just don’t GET it. They don’t seem to understand that the pretty red thing they stick in their kid’s lunch box has to come from SOMEWHERE. Everything is all interconnected. If there’s a drought in the Midwest and you can’t grow hay and corn, guess what? It’s going to cost the farmers more to feed their livestock. Their feed has to be shipped in, and that costs money! So what does that mean? The price of beef goes up! The price of milk goes up! Interesting stuff. The instructor isn’t all doom and gloom. He’s all about looking at the positives. Like I said last week after watching Lecture 1, I had NEVER heard of the word “Permaculture” before I was sent the link. I’m not looking to change the world. I’m not looking to hug a tree. 🙂 I just wanted to learn about something “new,” something different, make my tired brain work a bit. Still haven’t purchased any course books. This week’s homework assignment was to grow “something,” preferably something you can eat, even if it’s in a pot on your windowsill or outside your front door, even if you don’t think you can grow ANYTHING. Next post610 Kirby Street, I’m Writing Again. Btw, the apple orchard has a store that sells the apples and other goodies. They have an apple cider slushie that is out of this world! Love local festivals! Scary how the frost can impact things!!! There has been a disconnect with food and where it comes from for several generations. That is slowly changing for the better. You just helped. Thanks! I think my grandparent’s generation was the last generation in MY family to REALLY understand where our food comes from.